Welcome to our Facebook growth and engagement study for the month of August 2016. This is our monthly look at all the page likes growth and content engagement trends on the platform. We analyse 5,000 Facebook pages so you can easily compare your own performance to the platform standards. We also include all the other news and features that you should be aware of in order to run your Facebook page(s) more efficiently. Page likes growth in August was at 0.14% of the total audience. This is a 22.22% decrease compared to July. 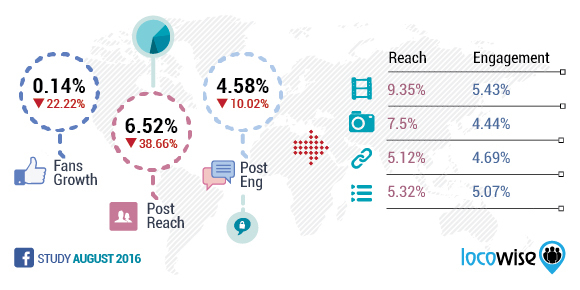 Post reach in August was at 6.52% of total page likes. This is a 38.66% decrease compared to July and it’s the lowest post reach we’ve seen since we started doing our studies in May 2015. Post reach has now fallen by 42.86% since the high in March 2016. Video posts reached 9.35% of the page likes, photos reached 7.5%, status updates 5.32% and link posts reached 5.12%. Engagement in August was at 4.58% of people reached. This is a 10.02% decrease compared to July and it’s the second lowest engagement rate we’ve seen since we started doing our monthly studies in March last year. Videos engaged 5.43% of the people reached, status updates engaged 5.07%, links 4.69%, and photos engaged 4.44%. We’ve already discussed several algorithmic changes that Facebook announced for the news feed in the recent months. These include the announcement that content from family and friends has the first priority in the news feed. All these changes may very well have had a big negative impact on the organic page growth and reach. We’ll keep following the stats over the upcoming months. This drop in reach doesn’t seem to have forced more pages to run Facebook advertising. 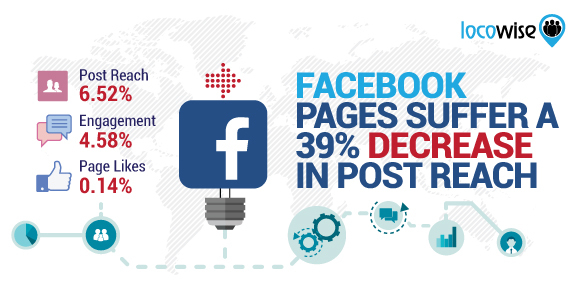 29.04% of pages used Facebook ads in August paying for 23.19% of their total reach. Both of these numbers are at a record low in the time period of our monthly studies. Another test underway on Facebook is video content being auto played with sound on. This test could bring a big change to the platform. As we’ve seen in our video study only 21.8% of Facebook video is clicked to play sound. In other words, 78.2% of all video views are mute. Currently, the videos you create must take this into consideration. Videos need to make sense and be engaging even when muted. Making all autoplay videos be with sound on by default would make a big difference, but it is to be seen how test users will respond to this. Facebook Offers feature finally got an update too. 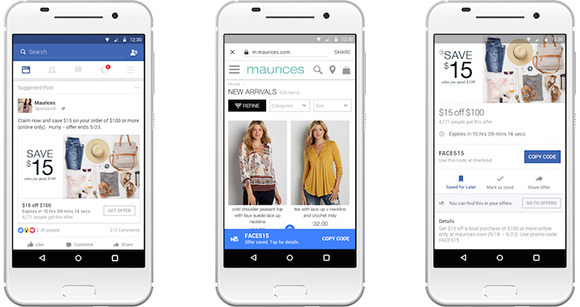 It’s now easier to post offers and to claim offers on mobiles. There’s an Offers tab in the mobile app and Facebook will start alerting people about the offers that are about to expire. Offers are one of the easiest ways for a brand to show a return on investment on their organic social media efforts. Offers make it easy to figure out how much money your Facebook page and the fans can bring to your business. It’s something worth testing to see what results you get. Offers can be used as paid ads too. Facebook is also changing the way they display vertical videos. The plan is to display a larger portion of a vertical video directly in the news feed without the user needing to click to expand to the full video size. This change is rolling out to all mobile app users and includes all video including ads and live broadcasts. For brands, it is something worth experimenting with as vertical videos will take more Facebook real estate per video than horizontal videos and might contribute to an increase in views and engagement. 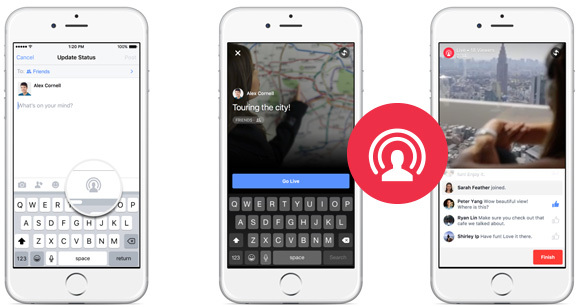 The ability to do two-person broadcasts on Facebook Live has now started rolling out to public figures and pages. This opens up a lot of new potential for a different type of live broadcasts, such as interviews. Another test with significant potential for Facebook is the placement of mid-roll advertising in video. The ads appear 5 minutes into a live broadcast and last up to 15 seconds. Facebook wants you to start sharing more personal content, especially images and video. One of the many tests the company is running is the camera-first mode which replaces the traditional text box field with a Snapchat-like user interface. As usual with all the experiments the release of a new feature to a wider public depends on the test results. It’s useful to have an overview of the tests Facebook is doing on the platform, be it on the way they display content on the news feed to bigger changes to the platform. Many of these might never make it live to the global audience, but they show what’s on the mind of Facebook executives and where they want to push the huge audience in the future. This article originally appeared in Locowise. This article was written by Marko Saric from Business2Community and was legally licensed through the NewsCred publisher network.